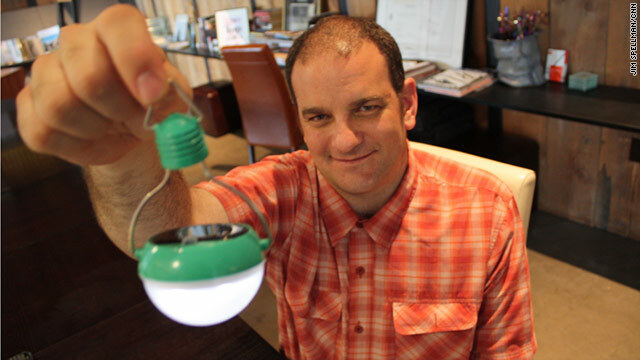 Inventor Steve Katsaros believes selling his solar bulbs, instead of donating them, will help more people in developing countries. Denver (CNN) -- It started with such a simple concept: A solar light bulb that charges up during the day and lights the night when the sun sets. Inventor Steve Katsaros perfected his design in June 2010, and four days later he had a patent in hand. He knew it was a good product, but he didn't know what to do with it. "It wasn't until after we created it that we asked ourselves, 'How do we market this,'" Katsaros says. "And we learned that the largest market was the developing world." As Katsaros began researching markets in developing countries, he began to realize that his solar light bulb could potentially make a huge impact on the 1.4 billion people around the world who don't have access to an electrical grid. 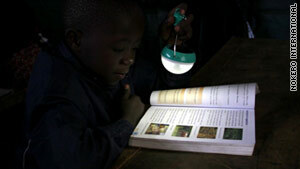 Many use fuel lamps that burn kerosene, which is costly, dirty and can also be unhealthy. He dubbed his company Nokero -- short for "No Kerosene" -- and set out to get his bulbs into as many hands a possible in the developing world. First, Katsaros had to answer a key question that would determine how he would have the strongest impact: should his company be nonprofit, or for-profit? Katsaros found inspiration from the 2008 book by Paul Polak, "Out of Poverty." 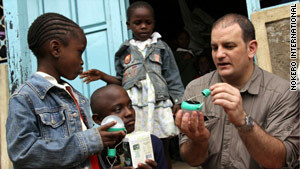 Communities that do not have access to electricity could benefit from Katsaros' solar light bulbs. Polak, who has worked in developing nations for 30 years, believes that the charity model of aid used by nonprofit organizations doesn't work -- despite its good intentions. The best way to help people, according to Polak, is to treat them as consumers. If you can sell to them, he says, you can help them. "In the beginning I was a nut case and nobody paid attention," Polak says. "The consensus was 30 years ago that this is what caused poverty, and to be involved in business was outrageous and evil." Today, that is starting to change, he says. But that doesn't mean that nongovernmental organizations have rolled out the red carpet for Polak's ideas. "Many NGOs say it's making money on the back of the poor, but I love to make money on the back of the poor," Polak says. "You can feel really good about yourself giving stuff away ... but if you are going to sell things to people, you need to have respect for them because no one is going to buy something if you have contempt for them." He says market forces will ensure that the right products get into the marketplace and ultimately lead to empowering people in developing countries to be better able to fend for themselves. "If you have a village that's used to the dole, it's very hard to get them off of the dole," Polak says. "We have to face the fact that conventional development aid has failed. After interviewing more than 3,000 families who live on $3 a day or less, Polak concluded that they know best how to care for their families. They will respond to a free market that presents them with products that will fit their needs, he says. "They are stubborn creative survival entrepreneurs," Polak says. "They make life and death decisions about how to spend their meager income. They are used to investing their money very wisely." In 1981 he founded International Development Enterprises. Though the company itself is a nonprofit, it uses a model called "social entrepreneurship," which utilizes capitalist principles to assist people in the developing world. So often, he says, large aid organizations simply don't understand what people need. Katsaros sells "business in a box" kits that entrepreneurs in Kenya and Tanzania can sell to villages at a profit. Polack points to the example of a product called the Play Pump. It seems like a great idea: A children's merry-go-round operates as a water pump. As children play on it, it pumps water into a holding tank. In 2006, the United States invested more than $16 million in a massive effort to install Play Pumps across sub-Saharan Africa. Four years later, 4,000 Play Pumps had been installed. But according to a UNICEF report the Play Pumps haven't worked as promised. At $14,000 each they are expensive. And the children grew bored of the hard work of "playing" on the merry-go-rounds, forcing women in the village to operate the pumps. In addition, the pumps proved to be unreliable, and when they break they require expert technicians to repair them, according to UNICEF. Polak says this is exactly the wrong approach because the people living in the villages were not given an opportunity to choose whether these pumps would work in their communities. "They're not going to spend their money on it if it doesn't make sense," Polak says. "The problem with a lot of these things using the charity model is that they get these things foisted on them." Polak's nonprofit markets a pump of its own, which costs about $8 to make and sells for $25. Polak says a small family farmer who buys a pump can increase his annual income by $100. He says they have sold 1.5 million in Bangladesh alone and have created thousands of jobs in turn. "We have 3,000 (villages) dealers making an income and 3,000 well drillers making an income, and 75 workshops making the pumps making an income," Polak says. And that is one of the key tenets of the social entrepreneurship model. It helps create more jobs and a network of dealers and distributors that can then be utilized to sell more products and ultimitely build a more robust economy in developing countries. This is something I personally believe in, to create smaller entrepreneurs around the globe. That's a model Katsaros hopes to replicate with his solar light bulbs. "This is something I personally believe in, to create smaller entrepreneurs around the globe," he says. "It's a business model I really love and believe in." So far, Nokero has mostly sold large orders to nonprofits and foreign governments, who sometimes give away the bulbs for humanitarian reasons. They aim to expand and build the business through social entrepreneurship. In Kenya and Tanzania they sell what they call "business in a box kits," 144 bulbs along with displays and fliers. Would-be entrepreneurs can go village-to-village selling the bulbs and establishing a network of customers. In the future, Katsaros hope to use this budding network to distribute new solar products to further help people who live away from the power grid. Being a for-profit company also allows Katsaros to keep working on new ideas without being tempted to move to a high paying corporate job. "Yeah, we could cash out at some point, but there's really no reason for that," he says. "We have a healthy company, we have good people working, and we're improving the lives of a lot of people already. We're happy."